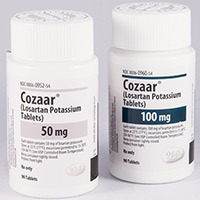 Losartan potassium 25mg, 50mg, 100mg; tabs. Treatment of diabetic nephropathy in type 2 diabetes with hypertension. Initially 50mg once daily; may increase to 100mg once daily. Concomitant aliskiren in patients with diabetes. Fetal toxicity may develop; discontinue if pregnancy is detected. Correct salt/volume depletion before starting therapy, or reduce initial dose. Renal impairment: monitor for worsening renal function. Hepatic impairment. Severe CHF. Renal artery stenosis. Monitor serum potassium periodically. Pregnancy (Cat.D). Nursing mothers: not recommended. Angiotensin II receptor blocker (ARB). See Contraindications. Hyperkalemia with concomitant other drugs that may increase serum potassium (eg, K+ supplements, K+ sparing diuretics, K+ containing salt substitutes). May be antagonized by, and renal toxicity potentiated by NSAIDs, including selective COX-2 inhibitors (monitor renal function periodically in elderly and/or volume-depleted). Monitor lithium. Dual inhibition of the renin-angiotensin system with ARBs, ACEIs, or aliskiren may increase risk of hypotension, hyperkalemia, renal function changes; monitor closely. Avoid concomitant aliskiren in renal impairment (CrCl <60mL/min). Upper respiratory infection, dizziness, nasal congestion, back pain; hypotension, hyperkalemia, renal failure, angioedema, cough. Hypertension (HTN). To reduce stroke risk in hypertensive patients with left ventricular hypertrophy (LVH); this benefit may not apply to black patients. HTN: initially 50mg once daily; may increase to max 100mg once daily. HTN with LVH: initially 50mg once daily; then add hydrochlorothiazide (HCTZ) 12.5mg/day and/or increase losartan to 100mg/day, then may increase HCTZ to 25mg/day. Volume-depleted (eg, on a diuretic) or mild-moderate hepatic impairment: initially 25mg once daily. <6yrs or CrCl <30mL/min: not recommended. HTN: ≥6yrs: initially 0.7mg/kg (max 50mg) once daily; usual max 1.4mg/kg (100mg) once daily.